The above quote popped up today as I was preparing to write this post about our most recent Generosity Day, and it made me stop and really think about the meaning behind this event. Yes, Wheelhouse DMG volunteers in the community every quarter. Yes, we manage the logistics so that every employee can participate. And yes, we want to tell you about it. But why do we do it? The answer, as it turns out, is simple. Our Generosity Day program is driven by our company values. We aim to be generous and helpful always, both inside and outside working hours, because we believe that those traits exercised in all aspects of our lives are what bring about positive change. Every Generosity Day, we get the chance to meet dozens of folks doing admirable, impactful work in our communities. Those connections are precious to us, and we’re hoping the stories of our Generosity Days will resonate and help forge future connections. We want to work with people at Wheelhouse who recognize the many needs in their neighborhoods, who share these values of helpfulness and generosity, AND we hope to inspire other companies to volunteer in their communities, too. 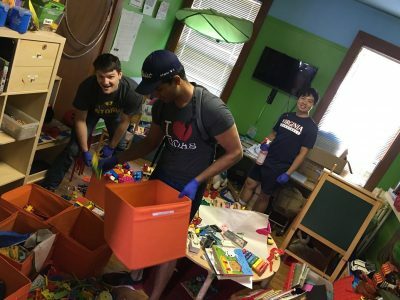 In early September, five Wheelhouse groups volunteered at six non-profit organizations. We organized hygiene supplies then prepared and served lunch at Immanuel Community Services for their clientele that come every day to use their showers and laundry facilities, and for the residents of their Recovery Program. 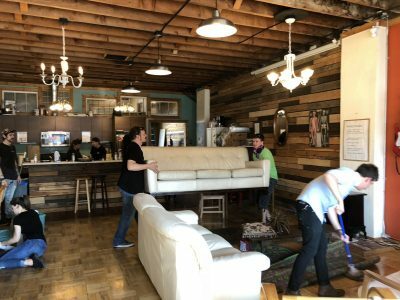 We helped the Recovery Café prep for their annual fundraiser, had lunch with participants in their program, then cleaned their workspace. We cleaned and organized the children’s play area at Sacred Heart Shelter then prepared lunch for the families of unhoused individuals in residence there. 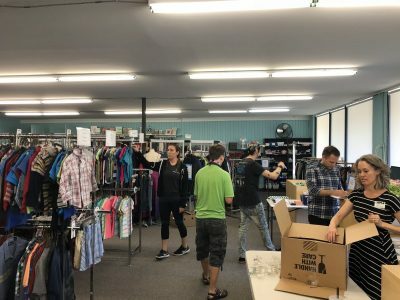 We organized and prepped the Clothes for Kids store in Lynnwood, so that families who qualify for the program could begin their school year with the clothing items they need. 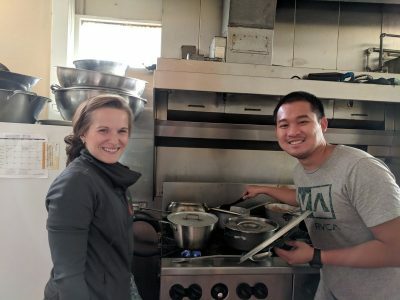 We performed a deep clean at the Aurora Commons so that unhoused neighbors could have a healthy space to prepare meals and connect to resources. We worked with incoming customers and set up a GoFundMe campaign for the Knights Community Hospital Equipment Lend Program in Kennewick, which helps to provide critical medical equipment to those in need. And we discovered once again how incredible the individuals are who run these programs. On very tight budgets, they manage to uplift and assist both the populations in their programs and anyone who drifts close to their radius. While we received thanks from the organizations for the work that we did last Thursday, we were all, without a doubt, the most thankful – thankful for the organizations on the frontlines, thankful we were able to help them strengthen our communities in small ways, and thankful that we have this opportunity to hopefully inspire you. If you’d like to learn more about Wheelhouse and our Generosity Days read about our Q2 work with the Low Income Housing Institute then visit us here. And if you’d like to see the current opportunities to join our team (and someday participate in a Generosity Day yourself), just visit our Careers Page.